Ten years on, Riverside remain as special as ever, and Love, Fear and the Time Machine is their truest work of art. For the past decade or so, Polish progressive rock/metal quartet Riverside set itself apart from their stylstiic brethren by offering distinguishing tones, mesmerizing atmospheres, and most importantly, remarkable songwriting. Sure, the band also infuses much of its music with the intricacy genre enthusiasts expect, but their melancholic, yet beautiful and earnest melodies and lyrics (credited mostly to singer/songwriter/bassist Mariusz Duda) have always come first. Perhaps nowhere in its discography is this more apparent than on their newest opus, Love, Fear and the Time Machine. Although it features a few complex arrangements, the record is by far Riverside’s most straightforward and accessible collection to date, showcasing a proclivity for upfront compositions like never before. While this may disappoint fans who adore the group’s more tangential, frantic instrumentation, rest assured that the album’s stunning emotionality and breathtaking arrangements more than make up for it. Without a doubt, Love, Fear and the Time Machine features some of the most gorgeous, tragic, and ultimately inspiring pieces Riverside have ever recorded, making it another exceptional entry in an invaluable catalog. Fittingly, then, the sequence starts with “Lost (Why Should I Be Frightened by a Hat? )”, which is arguably its best track. Duda begins by reciting a philosophical recollection over a delicate ether of keyboards and bass and guitar notes. Afterward, he launches into a catchy and charming chorus: “Come follow me / We’ll go down / Where the river flows / One day / Just you and I will find a bridge / To another land". Duda layers his voices too, making it even more gripping, and in-between his passages, guitarist Piotr Grudziński issues his signature soaring accompaniment as the composition evolves. Drummer Piotr Kozieradzki keeps things steady throughout, while keyboardist Michał Łapaj gets the spotlight during the final seconds. Ultimately, “Lost” exemplifies the magnificent succinctness that makes Love, Fear and the Time Machine distinctive in the Riverside canon. Later on, “#Addicted” truly feels like a progressive rock take on the Cure in several ways, such as its dominant bass lines, starry guitar lines, and wistful singing which finds Duda channeling a silky falsetto he’s never really attempted before. There’s also a brief acoustic guitar arpeggio at the end that’s very enjoyable. Lyrically, it serves as a commentary on how social media can transform people into egocentric users who base their self-worth on their digital populiarty. In this way, both its lyrics and music find Riverside stretching slightly beyond its comfort zone, but the result is undeniably, well, addictive. “Caterpillar and the Barbed Wire” feels more traditional, with Duda’s sorrowful confessions and counterpoints perfectly complemented by sharp guitar riffs, aching solos, enveloping percussion, and a moving layer of synthesized splendor. Honestly, it’s like a heartbreaking and somewhat more colorful missing track from Shine of New Generation Slaves, whereas “Saturate Me” contains the sleek yet eccentric tones and virtuosic yet blunt balance that made up the best moments on Rapid Eye Movement. Of course, its sad ponderings, such as “Am I Invisible? / Or alive? / I don’t want to feel like I’m no one anymore", are archetypal Riverside sentiments, and the interlocking musical patterns (especially near the end) are equally touching. The most commercial segment on Love, Fear and the Time Machine is surely "Discard Your Fear"; however, despite that typically negative connotation, the song’s approachability doesn’t get in the way of its worth. Rather, it’s uplifting message and relatively simple and familiar construction could earn Riverside an entirely new camp of fans. It’s actually quite cathartic, as is the dreamy and tasteful “Toward the Blue Horizon", which begins and ends as a luscious ode (with lovely piano chords) while transforming into a progressive metal workout in the middle. Both of the record’s final two pieces—“Time Travellers” and “Found (The Unexpected Flaw of Searching)”—are wonderful. The former is an exquisite acoustic ballad about past possibilities and the unforeseen future. Its winding melodies and spaciousness are the standout features, as the rest of the band lets Duda’s voice lead the way, resulting in a simple but commanding experience. In contrast, the latter is more elaborate, impactful, and conclusive, with a strong sense of closure and acceptance, as the speaker realizes the importance of his or her experiences, uncertainties, and decisions. The music builds with great pacing, adding more beautiful layers as the chorus (“It’s a lovely life / You have gone so far / Don’t give it up / Oh, it’s a lovely life / Gotta go with what you think is right”) repeats with sleek harmonies. By the end, listeners are left in awe, reevaluating their own sense of purpose and optimism. 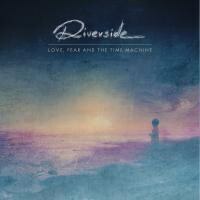 Love, Fear and the Time Machine is likely the most polarizing record Riverside has made, as it could be considered both the band’s strongest and weakest full-length effort. Fans hoping for virtuosic jams and unexpected sounds won’t really find them here, while fans looking for more of Riverside’s token elegant instrumentation, affective melodies, and poetic, rich singing will be satisfied beyond measure. Either way, Love, Fear and the Time Machine definitely finds its creators reaching for new, if marginally different, heights, which is commendable in and of itself. Roughly ten years on, Riverside remains as special as ever, and Love, Fear and the Time Machine is, in several ways, its truest work of art.